TED 5000 the energy detective Electric Meter is designed to work with your home network, and also keeps the history of your electrical usage. You can view your electricity consumption in a number of ways, right through any web browser connected to your home network, including cell phones having web display. The TED Footprints software, which was an optional package in the original TED series is now included, and works on Windows, Mac and anything with a browser. There are several free iPhone applications for The Energy Detective, and browser plug-ins. 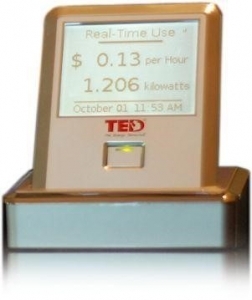 By being part of the computer age, TED makes it easy to see, but more importantly understand your electricity usage. The TED 5000-G and TED 5000-c the energy detective Electric Meter are the core models of the The Energy Detective 5000 electricity monitor series. We’re now also selling the TED 5002-C and TED 5002-G models, which are simply the TED 5000 with the extra hardware needed to monitor a sub-panel, a 400 amp split service, solar PV or wind, or even monitor a single circuit separately. The Energy Detective 5000-G (or 5002-G) allows you to view your electricity use on your computer or mobile device. The Energy Detective 5000-C (or 5002-C) extends the functionality of the 5000-G by adding a table-top display so that you can see your usage at the moment — install in your kitchen, hallway or living room. We think the display is an important part of the benefits of home energy monitors — out of sight is out of mind, as they say; monitor electric usage carefully and you’ll learn how your home works as a system … and end up with a lower electricity bill. As with all TED 5000 models, the TED 5000G and 5000C give you access to Google PowerMeter. View both real-time and historical data on any computer attached to your home network (even your smart phone!). The TED Gateway stores 60 minutes of Second-data, 2 days of Minute-data, 7 days of Hourly-data, 90 days of Daily-data, and 10 years of Monthly-data. All of this data can be downloaded to your computer, or uploaded to Google PowerMeter. While the display unit is supposed to have an internal battery that allows you to disconnect it and walk around, the battery life of most units appears to be very short — sometimes a matter of seconds. The display unit connects to the gateway via Zigbee wireless protocol. The range of the display to the gateway is quite limited, especially through floors and walls. 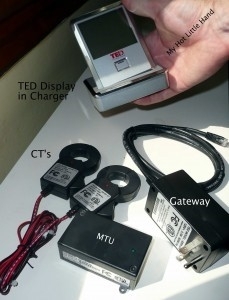 The earlier version of TED had software, but only connected via USB cable, and reports from those in the know were that it wasn’t very useful. The new software looks intriguing, even having the ability to identify certain high-load devices (dryer? electric water heater?) and identifying them discretely from other electricity users. TED 5000-c the energy detective Electric Meter is a different and much smarter device, under the hood. For one, it hooks right in to your computer network. Most likely, you have a router (maybe a wireless one) that’s hooked to your DSL or cable modem. Most (if not all) wireless routers also have a few plugs for good old Ethernet network cables, and so does TED 5000.And TED 5000 cleverly communicates from it’s electrical box part (the MTU) to it’s router-connected part (the Gateway) without wires. You don’t need to care about how, other than this means you can have your router wherever you want. The only way to really know how to save electricity is by understanding how much power products actually use. Being able to see how much you are spending at any moment is a powerful motivational tool to save energy!